Over of the past ten years Cloud Computing has drifted from a term used almost exclusively by the IT elite to the technology behind your elderly parents smart phone. Consumers and businesses have embraced the new technology and so investment and advances have become exponential. Cloud computing has truely become the norm with services such as Google drive, Dropbox and Amazon (web services) being part of most of our daily lives. Yet, as with most technology a level of confusion and complication has risen with the rise of the cloud based powerhouses. New technology (e.g. Apple Pay & mobile website requirments) rise from unheard of to mainstream within a matter of months and businesses are told to adapt or die! So are these businesses (particularly those small and medium sized businesses already lean in human and financial resources) able to keep up and embrace the new technology or are they left out in the cold, out maneuvered by their larger competitors? 1. GetApp Partnership 2. Results – 500 SMB’s Interviewed 3. Why switch to cloud computing? 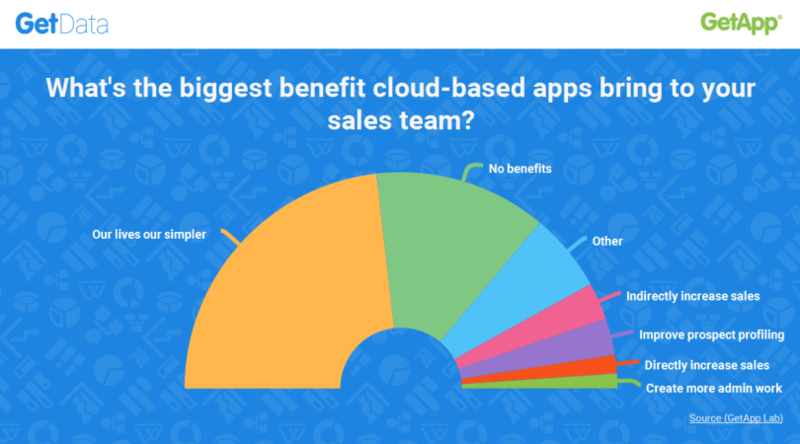 From the following options, whatâ€™s the biggest benefit cloud-based apps have brought to your sales team? Since we represent a cloud-based CRM we’re pleased so many businesses found their lives simpler since cloud adoption. Yet why did 25.8% (129 of the 500 asked) find no benefit? Had they simply not adopted cloud-based apps or were they so complicated they had become overwhelmed and failed to implement correctly? This would certainly align with research we uncovered on CRM Software; we discovered “Anywhere from 25% to 75% of CRM implementations fail to meet expectations, or fail outright and never get used.” With such a high number in just the CRM sphere it’s likely the issue (failed implementations) extends beyond CRM into multiple cloud applications. 3. Why switch to cloud computing? In order to fully understand whether cloud computing is helping or hindering small business we interviewed another two companies (one US based and one UK) to determine why they made the shift and if they continue to benefit. “The decision was made following hurricane Sandy; both our Manhattan and Brooklyn offices were closed for almost 5 days with no power, phones or internet. Since our Queens office still had electricity and internet we moved all servers there and post restoration we began moving the servers back. After the infrastructure was updated and website propagated it took almost 2 weeks to get the system back to normal operations. We decided to move to the cloud. Initially to keep our servers running in case of another disaster. But then we realized cloud isn’t only about remote storage and began widely embracing and adopting further options (content delivery based on region and automatic load balancing and healing). “Our business is split between two offices at different ends of the country, our sales and marketing office is in Oxfordshire and our tech team and developers are based in Worcestershire. Cloud storage enables us to store, share and access data and documents from the two sites or wherever one of the team is working in the UK. Companies (such as NRI & Trusted Care) that have a successful implementation see huge benefits in cloud computing, with cost savings and flexibility being the main driving forces. However when inappropriate systems are adopted (particularly systems that don’t ‘talk’ to existing software) the time it takes to complete tasks can actually extend, marry this with the costs involved and you can see how rising friction can amount for some organisations. Do you represent a small to medium sized business? How does cloud computing benefit your business?